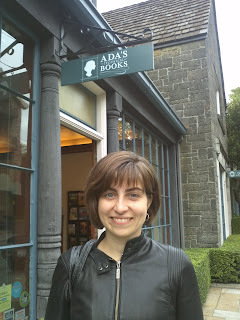 I've walked past Ada's Technical Books a few times in the last few months and noticed some very cool window display items (such as Neal Stephenson's Reamde), but I was always there when it was closed. Yesterday however, I happened to be in the area when it was open and got a chance to finally browse inside. This store is so neat! It's named for Ada Lovelace, widely thought to be the first female computer programmer. There were little references to technical women throughout the store, including a book about Grace Hopper in the biography section, greeting cards featuring technical women at the front of the store, and of course the name of the shop itself. Besides this, there is a very nice selection of technical books, quirky puzzles and games, biographies about famous scientists, programmers, and mathmeticians, and even a small sci-fi and young adult section. In the latter I spied a Marvel comic version of Orson Scott Card's Ender's Game - have any of you read it? Would you recommend it?